Any other Tal Klevzov users on this forum? From around 1995 till 2015 Tal (based in Novosibirsk) produced some fine cats with a Klevzov-Cassegrains design, the Tal 150/200/250K. I rarely see something about these scopes in this part of the forum. As a user of a Tal 200K, my question is if there any other users of a Tal Klevzov, and if so, can you give some details ? To start up this topic, some info about my 200K: I have no. 2001-95 with a F10 focal ratio and straight vanes. I bought it second hand some 10 years ago as a complete package in the big birchwooden case with the Tal GEM 2 mount. I don't use this mount, because it causes too much vibrations, the OTA now rides on a Orion Sirius EQ-G. For that I had to attach a Vixen-style dovetail underneath the standard Tal dovetail. I also replaced the focusser for a 2" Crawmach double speed, which is a really step up and a joy to use. The last modification I did on this scope is the fitting of a RDF, which I prefer above the (really good!) 10x50 standard viewfinder. I really like this scope, it gives very sharp views across the whole FOV, it cools down rather quickly and I don't need anything against dew due to its open design. The only disadvantage is its weight (24 lbs). Edited by Edwin, 08 July 2018 - 08:26 AM. I'm a new owner of a TAL 200K. Just bought it last week, from someone local secondhand but in pristine condition, only used 3 times. Came with an EQ5 but already got one of those, and I have an EQ6 in the obsy! It's Serial No 0795-2008 one of the newer ones - F8.5 with a 1.25in Crayford focuser. Bought it as I have an Orion Optics Europa 150 Newtonian, and had been given an old Vixen 102M, and had been thinking of getting a CAT - when this came up - after a bit or research - I had to have it! So it's installed in the obsy waiting for a clear sky! All I have to do now if figure out how to fit my guide scope - although I suppose I could ditch the finder and use the finder rings. BTW You might want to correct your spelling of Klevtzov. Wow, that's one of the newer ones, with curved spider I assume ? Good idea to use the EQ6, I tried a LXD75 (which is equivalent with an EQ5), but found the OTA too heavy for it, too much vibrations. Actually, it is Klevzov, Klevtzov or Klevtsov, all three are possible (but the npzoptics.ru site uses Klevtsov). Good luck with your Tal, hope you enjoy it as much as I do ! Edited by Edwin, 10 July 2018 - 02:12 PM. I have a 200K also. 200mm F10 model. Bought in 2007, 2nd hand. Had lusted after one since 2000/01. Never been dissapointed with mine. A true joy to use. # 0152 2001 with the 3 curved veins. I use the Klevtsov spelling, as per the factory and perhaps more importantly, the optical designers name, Yuri Andreevich Klevtsov (Юрии Андреевиче Клевцове). Edwin - You actually have quite a rare 200K. Can't be many with the straight veins! The scopes started with curved veins, changed to straight, for a very short run, then went back to the curved style, until the end of the F10 run and continued with the F8.5 version. 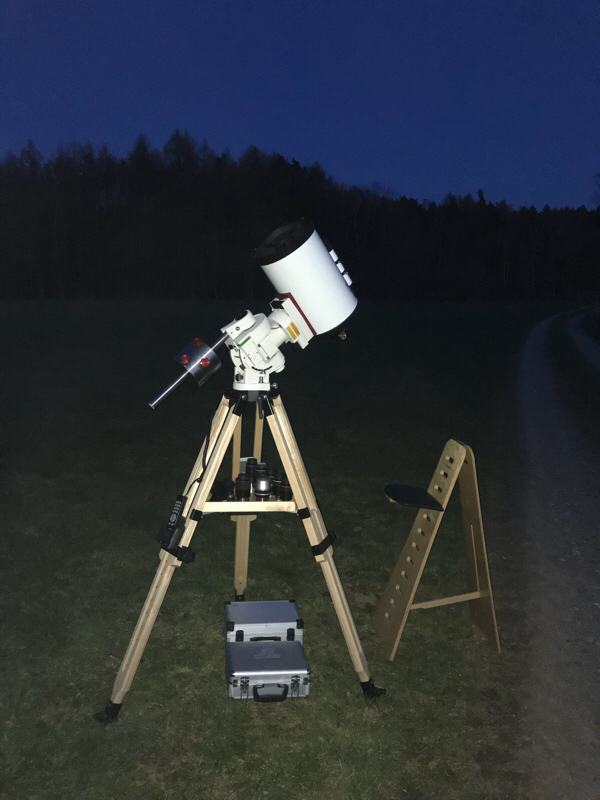 Here is another Klevtsov user - located under Mid-European skies in Germany. I own the 10” version of the TAL-Klevtsov till 2011. I ordered the Klevtsov scope directly from Novosibirsk, what was quite difficult and thrilling (contract, customs, shipping ...). Edited by Andreas-TAL, 24 August 2018 - 06:29 AM. I have been thinking of getting one of these for a while now. I bought a VC200L because it was supposed to be superior to a C8, but mine is certainly not. I have read Wolfgang Rohr's reports, and searched the web, but I still am not convinced. So does anybody know or have a feel for the quality one can expect from these scopes? Are you guys just the lucky ones or are they generally good scopes? Well ... first of all the VMC or VCL design is not a Klevtsov design. Yes, both designs use subaperture correctors (and I think both are all spherical telescopes) but the details, especially within the so called “corrector unit” are different. To be honest the VIXEN designs doesn’t convince me at all. The practical experiences of the VMC/VCL often reported thermal issues of the tube, sometimes quite “fat” bright stars due to the straight and quite thick spider veins and occasionally collimation issues. or here at CN, too. He uses a serial model TAL-250K for his extraordinary pictures. Of course he is brilliant in image processing, but with a lemon tube you can’t achieve these results. Anywhere he published the interferometry of his TAL-250K: As far as I remember about 0.9 Strehl - definitely a good one, but no phenomenal quality. From my point of view the Klevtsov design (if the spherical aberration is under control) provides very crisp star images (what I would call “refractor-like”). Open clusters, star fields are a real pleasure. Very bright stars show a little halo, but due to the curved veins, quite well covered. The thermal equilibrium is as well much much better compared to the VIXEN subapertur tubes I have seen. Compared to a SC or VMC/VCL the Klevtsov images look a little bit fainter (there are many glass elements light has to pass till it reaches your eye). The central obstruction is about 35% (linear), so “blurred” images on planets (compared with a 7 or 8” unobstructed telescope) are unavoidable. But that’s in common with any other obstructed telescopes. My conclusion is quite simple: If you own a good diffraction-limited Klevtsov type telescope (let’s say about RMS 1/18-1/20 lambda/wave) you will love it - definitely. It’s a precious keeper! BUT thats only the the half of truth. The other half is: You’ll have to find a diffraction limited Klevtsov. Edited by Andreas-TAL, 30 August 2018 - 04:00 PM. Thanks, Andreas, for an honest answer. Since I got burned with the Vixen, I have only bought Newtonians and refractors. I really like the idea behind the Cats, but there always seems to be a quality issue with them. Some good, a few great, and some dogs. Is there any dealer who will deliver only good or better scopes? No, as far as I know they “big players” guarantee diffraction limited quality and nothing more. Sometimes the manufacturer itself offers “premium versions”: For example the “deluxe versions” from INTES. The other way is to go to a small, highly skilled manufacturer, producing single, very individual telescopes. But choosing this way you need time and money. upgraded the focuser to a GSO2, which is now hooked up to a arduino- based autofocus system. works well. fiddling around with a focal reducer, did any of you guys tackle that? There is a 150 on ebay. 2002 with curved vein spider. I was impressed by its focuser. These things are really hard to search for with so many different spellings. All I see is a bunch of water bottles! 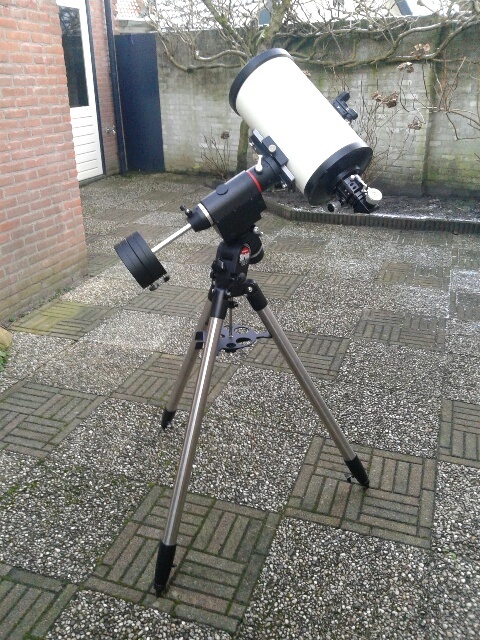 Well, took my TAL 200K to an, in the Netherlands well-known, master astro-optician for a check out today. TAL has always claimed that their telescopes don’t need any collimation by the end-user and made it very difficult to do so. The collimation screws for the primary for example are covered by the backplate on which the focusser is attached. If you want to collimate, you've to remove the focusser (a cold bath for the person that came up with this idea).The views my TAL threw up were always satisfying enough for me, and I didn't see any miscollimation. A check on high magnification today showed that collimation wasn't OK. It took the optician several hours and a lot of effort and he had to take half the scope apart to get the collimation right. The components of which TAL scopes are made are rough and rudimentary but the quality is OK. Too bad the boys and girls in the assembly-department sometimes look too deep in the wodka-glass and don't give proper attention to final assembly and adjustment. After collimating a startest and ronchitest was performed and both indicated what I already suspected: the performance is really good with an estimated PtV of 1/6 Lambda, not too shabby !! Typical Russian optical quality. Too bad assembly and factory final adjustments sometimes go wrong (but that can be solved athough it takes someone with a lot of experience due to the complex Klevtsov-Cassegrain design). Edited by Edwin, 11 March 2019 - 03:44 PM. Here is a instruction how to adjust the corrector unit of a TAL Klevtsov telescope I got from Yuri A. Klevtsov. The procedure itself isn’t quite difficult, but you’ll need some technology behind the stage: Helium-Neon Laser, some microstages or any other micrometer adjustment devices. The physical “effect” the described technology uses are the so called “Newtonian rings” - a phenomenon which occurs when the laser beam passes the different materials in the corrector unit (glass, air, mirror reflections). Unfortunately it’s written in German, may be the pictures are helpful too. You have to scroll to the post#44 (number is on the upper right side). Post #66 may be helpful too, cause it shows the collimation of the main mirror. Edited by Andreas-TAL, 13 March 2019 - 04:40 PM. Wow, a lot of helpfull info in that thread, really interesting, thanks for that! The master optician started with adjusting the primary by turning the six screws on the back and concluded, after the primary was set OK (the laser beam shone exactly through the optical fence in the secundary unit) the secundary also needed adjustment. For adjusting the secundary, he had to diassemble the spider with secundary unit, because the three adjustment-screws for the secundary didn’t have enough travel. After loosening the central screw for about 1mm this needed extra space made it possible to achieve proper alignment of the secundary. Of course he had to go back and forth several times between primary and secundary before the collimation (on 600x magnification on an artificial star) was OK. I’m happy, propably couldn’t have done this by myself. Edited by Edwin, 15 March 2019 - 03:16 AM.